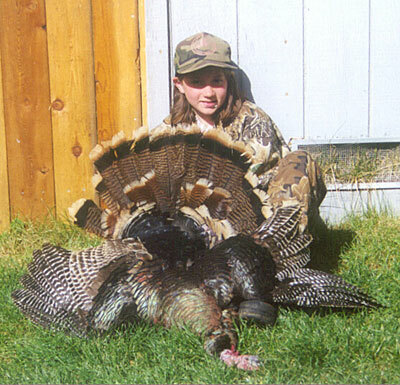 Here is my 11-year-old daughter, Nicole Larsen, with her first turkey (her first shot at any game animal). The turkey was taken on Easter Sunday in Lake County, California. Two jakes came strutting and gobbling to the calling and Nicole took her time and made sure of her shot, dropping this bird. She later told me that, "I thought my heart was going to come out my throat!" She is hooked on turkey hunting now.